I’ve got Pinterest on the brain. I’ve been trying to write this post about what’s been going on lately and I can’t get it out. All I can think about is Pinterest. It’s my latest obsession and it’s taking over my brain. 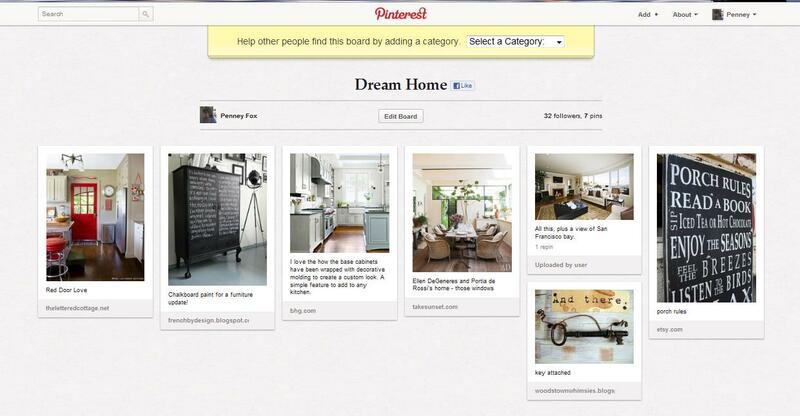 For those of you who don’t know what Pinterest is or haven’t taken the plunge to sign up, it’s the hottest new social media program where you set up ‘boards,’ follow people/companies to see what they ‘pin’ on their boards and if you want a copy of that image, you ‘pin’ it to your board. In basic terms, that’s pretty much it. BUT once you click on over and see those wonderfully amazing images on your screen, its hard to resist clicking on that mouse to ‘pin’ another picture to your boards. I even wrote a blog post about it for my business this week to give me an excuse to be on the site even more. By that point, I had convinced myself it was research. Finally, I had to ask … what’s up with the Pinterest obsession? After sitting in front of my boards again for the hundredth time, it finally hit me. I was looking at my own version of an online vision board. I actually have a vision board that I made awhile ago. It hangs in my office where I can see it every day and if I want to add new items to it, I just glue them over the ones that are already there. It’s become quite the collage over the past couple of years. But Pinterest is more then just cutting some pictures and gluing them onto a board. It became more then just thinking about my dream home (one of my boards by the way). I was able to visually see the image of the living room that had crossed through my thoughts, click on it and look at it in all its beautiful imagery. It’s these visions that keep circling around in our heads and now, here they are … all ready for us to pin to our boards. These images were pulling me into my own desires – where do I want to go (yep, another board!) and what do I want to do with my life (my bucket list board, which currently is a bit empty). It’s this place where you get to ask yourself what connects with you, what makes you laugh and remind us of some of our favorite memories . When I look at my boards, I wonder, what is it telling me about myself? I just got started in the Pinterest world and I’m curious to see how this will work itself out. Right now, I’m just letting it speak to me with these brilliant photos and see if it will help me answer what do I want with my journey and who do I want to become. I hope you’ll follow me on Pinterest and I’ll follow you back. If you have some thoughts on this new online vision board, please share in the comments. I got the acceptance note, but I have yet to actually log in. I am not sure if it’s something I’d get totally addicted to or that I would be totally lost on. I am afraid to find out.